No part of the German Sky Alliance website design or layout may be reproduced or transmitted in any form or by any other means electronic or mechanical to include photocopying, recording, reproducing, or electronic storage. Any such act represents a copyright violation and theft of intellectual property solely owned by German SKY Alliance. The web site clearly shows, there is a direct affiliation with former German Sky Airlines and but the site is not a commercial website. German Sky Alliance is only Virtual Airlines. The organization is not a real world airline, nor are there any real world offices in our hub locations. The organization does not hire individuals for any sort of real world employment. German Sky Alliance exists in whole to be a community of hobbyists who enjoy the hobby of Flight Simulation using Microsoft Flight Simulator or similar. All flight related information including charts, airport diagrams, flight schedules, etc., are for the sole purpose of German Sky Alliance pilots and not be used in real world aviation. 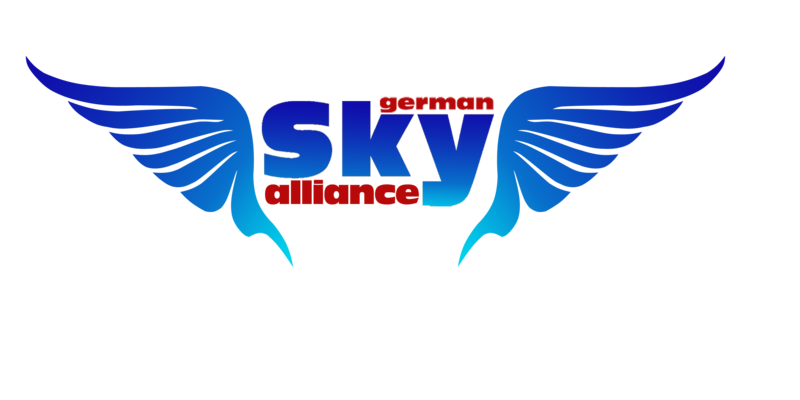 German Sky Alliance sole purpose is to provide entertainment for the voluntary members of the organization. German Sky Alliance is a non-profit entity and generates no revenue whatsoever. Any operation or documentation that is similar to any actual airline is purely coincidental and is in no way intended to violate any copyright, trademarks or other protection laws. The German Sky Airlines logo and trademark on this site remain the property of German Sky Airlines. German SKY Alliance is in affiliated with the real world German Sky Airlines. But there is no trade channel for German Sky Alliance. The web-site is for entertainment and education and not for a commercial purpose. The German Sky Alliance website does not have the ability to accept or purchase airline tickets. The German SKY Alliance publicly accessible website does not have any flight schedules or booking pages available which could confuse a customer in believing they were booking a flight from German SKY Airlines.